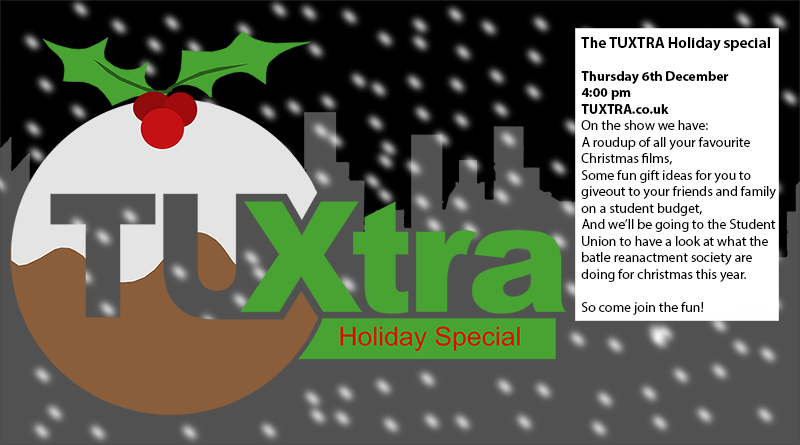 Join TU Xtra for our Xtravaganza this Thursday 6th December at 4pm. First of all, we’re talking about the University’s societies; what they’re doing for Christmas and what makes the battle reenactment society stand out. Next up, find out our top gifts for the winter season. And before you leave us to dig into a box of celebrations, we have a special entertainment roundup featuring the top Christmas films of the year. The 15 minute broadcast will be produced and aired by a team of eager first year film and TV students for our practical assessment this semester. Why not come and give it a watch? We hope you can join us for some festive fun and see what makes Teesside Magical this Christmas.